Zoo grounds close at 5 p.m.
BREC's Baton Rouge Zoo is open every day of the year except for New Year's Day, Thanksgiving, Christmas Eve and Christmas Day. Due to daylight savings time and the extra hours of sunshine, the Zoo is open later during summer weekends! During April through August, the admission gate is open from 9:30 a.m. to 5 p.m., and Zoo grounds close at 6 p.m. The Zoo is a non-smoking facility. Notice: Effective April 1, 2016, a state sales tax of 5% will be applied to admission to all zoological parks in accordance with the Louisiana Department of Revenue and tax code 47:301(14)(b)(ii). On July 1, 2016, that amount will reduce to 3%. For more information, please visit www.rev.state.la.us. Wednesday Afternoons: $1.50 + tax for all ages between 2pm - 5pm. Because the Zoo remains open during inclement weather, the Zoo offers no refunds or rainchecks. See our school group information at our Field Trip Page. 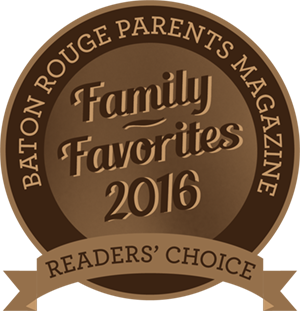 Join Friends of the Baton Rouge Zoo and visit all year for free! Your annual membership benefits include our reciprocal program where you may visit more than 150 zoos and aquariums in the U.S. for free or discounted admission with your Friends of the Zoo membership. Visit the Zoo every Wednesday from 2 p.m. to 4 p.m. for $1.50 + tax per person. Zoo grounds close at 5 p.m. Strollers and wheelchairs are available on a first come, first served basis. No advance reservations are accepted. A driver's license is required in order to rent a stroller. A visit to the Zoo is not complete without a ride on the scenic Cypress Bayou Railroad. This adventure takes guests into the beautiful wetlands surrounding the Zoo perimeter. The train runs daily beginning at 10 a.m. with continuous runs every half hour, weather permitting. Take a ride on the Baton Rouge Zoo Tram. Enjoy a leisurely 25-minute, narrated sidewalk ride throughout your Zoo. Available by reservation only and one week notice is required. Minimum 15 people. Please contact our Guest Services manager at 225-775-3877 option 3 or rentals@brzoo.org. The Flamingo Café is open daily and offers a variety of foods, drinks and snacks. Seasonal concessions are available at the Cool Critters Cafe, located near KidsZoo. Drinks may be purchased at the food stands or in vending machines throughout the Zoo. The Zoo does not have public picnic facilities. Groups are not allowed to bring food or drinks into the Zoo. Greenwood Park, just north of the Zoo, has picnic facilities for public use. The Zoo offers many options for your next birthday party, company picnic or family reunion. To learn more, please click here. Single admission passes, train tickets and memberships are available for purchase. These passes make great gifts to include in birthday cards, thank you notes and stocking stuffers. To purchase, please call (225) 775-3877. Please keep our animals healthy, and do not feed them. All animals are on carefully controlled, nutritionally balanced diets. Public feeding undermines our efforts to keep them healthy. Pets, bicycles, rollerblades, skateboards and skates are prohibited. Please protect Zoo plants by not picking the flowers or leaves. Children must be accompanied by a parent or adult chaperone at all times.